The Breaks Interstate Park is one of two interstate parks in America and encompasses 4,500 acres of woodland. The Breaks, home of the deepest gorge east of the Mississippi River, also rises to lofty heights where golden eagles make their home. The Towers and other rock formations, caves, flora and wildlife make the Breaks Park a unique tourist destination. 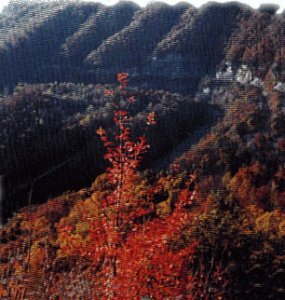 History, legend and lore combine with the scenic beauty of the Park which was the reported destination of several trips by Daniel Boone. It is the home of Pow Wow Cave, used by the Shawnee Indians and those who love mystery and adventure can search for the buried silver treasure of John Swift. For active visitors, the park also offers hiking, bike and driving trails, picnic and recreation areas, a lake with pedal boats, a swimming pool, horseback riding and an amphitheater. A rustic lodge, cottages and a large campground are available for extended visits. The Breaks Park also has a modern conference center, restaurant, gift shop and visitor's center. The folks in Eastern Kentucky and Southwest Virginia welcome you to the Breaks Interstate Park! Come explore and enjoy our "Grand Canyon." Activities: Swimming, hiking, boating, whitewater rafting (seasonal), whitewater canoeing and kayaking (with your own craft), and horseback riding. Pond fishing for bass and bluegill, and river fishing for bass, trout, and walleye. Facilities: Visitor center, campground (electric, water, and sewer available; alcohol not allowed), restaurant, gift shop, housekeeping cottages, motor lodge, pool and snack bar, hiking trails, bike trail, boat dock and rental boats, stable and rental horses, fishing lake (license may be purchased at visitor center), picnic shelters. Primitive camping allowed in backcountry by permit. Visitor center: open April 1 - Oct 31. Campground: open April 1 - Oct. 31. Restaurant and gift shop: open April 1 - Dec. 21. Pool and snack bar: open Memorial Day weekend - Labor Day. Fees: A fee is charged for admission, and for campsites, cottages, motor lodge, picnic shelters, pool, pedal boats, and horse rides. For more information: Breaks Interstate Park, PO Box 100, Breaks, VA 24607-0100. Phone (276) 865-4413 or 4414. Reserve rooms today at the Brookshire Inn and enjoy the beautiful scenery of the Breaks Interstate Park only 45 miles away. Call hotel direct at 1-888-433-1107.